Success is less contingent upon what life deals you than it is upon how you respond to it. Cast in point: I joined a handful of pro anglers and representatives from PRADCO Outdoors for what was scheduled as a two-day stretch of fishing, interviews and copious picture taking. As it turned out, we got in about a day and a quarter of work, as the tail end of a brutal storm system swept across Arkansas' Lake Ouachita and rained out most of day one. Disappoint, yes; but what was taken turned out to be a good trade for what was given - a lesson in making good use of life's frequent delays. First on my list of the day's objectives was a set of walleye photos with Arkansas legend Bobby Murray - winner of the first Bassmaster Classic and devout toothy fish enthusiast. Launching at Mountain Harbor Resort, we secured a nice photo fish and posed our shoot near a forested point that extended into an underwater ridge not far from Shangri La Marina. I think I fired off maybe a dozen pictures when the darkening sky and sudden rush of cool air shouted "Time to go!" Murray zipped us over to a vacant slip just as the tin roof tap dance began. Local pro Chris Elders and PRADCO PR chief Lawrence Taylor soon joined us and we all kicked back to wait out the storm. Smart phone weather apps promised occasional weather breaks, but Mother Nature had other plans and we soon realized we'd be spending a good stretch at that marina. At first blush, this may sound like a real bummer; but here's the beauty of finding yourself rain-stranded at a marina - overlooked opportunity. Elders was first to crack. He grabbed a medium-action All-Star spinning outfit rigged with a 1/16-ounce jig head and a small curly-tail grub and started dropping slip corners. Two crappie was all it took for Taylor and Murray to join the mission. Bait Selection: For broad appeal, Taylor fished a Lindy Watsit Jig, which mimics a variety of forage. Murray went with a 2-inch Yum Houdini Fry on a 1/16-ounce leadhead - a bait that allowed him to employ a more dynamic presentation. "I like to walk this bait down the edge of the dock," Murray said. "When you wiggle it through the water, it swims just like a real minnow. These dock crappie have a PhD. They've seen every bait and they know ever trick." Presentation: A quick glance into just about any slip corner revealed a handful of bluegill holding close to the structure. 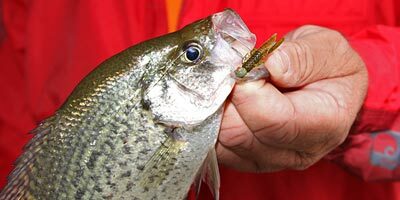 As Elders noted, the crappie will typically hang a good bit deeper and that's why your small leadhead jigs are a good bet. Drop it down and work it back up with incremental steps. Likely Spots: While any slip could conceivably hold crappie, Taylor made a wise observation: "I look for corners with cobwebs because I know that corner hasn't seen a bait." Also worth noting, a tapestry of spider silk points to an area ripe with insects. Spiders are efficient critters and they choose their spots wisely. Bluegill are also quick to identify areas with high concentrations of insects, as this means the occasional meal falling to the surface. If you care to mix in some bluegill action, cobwebs can point you to likely starting points. All in the Angles: While a straight drop did the trick on several crappie, Taylor also connected by casting from one end of a slip to the other and letting his bait swing across like a pendulum. This presentation has a few key benefits: It covers a broader area, tempts fish throughout the water column and sneaks into the strike zone less intrusively when the fish start shying away from a straight drop. Each of the guys caught several crappie up to about a pound. What did I get? A great lesson in opportunistic fishing and a profound appreciation for rainy days.